Sago starch is prepared from the pith of several genera of palms, Metroxylon, Borassus, and Arenga, and from cycads of the genus Cycas, native to the East Indies. In the form of small whitish, pinkish, or brownish grains, sago is exported to Europe and America, where it is used mainly for thickening soups and making puddings. It is more widely used in Indonesia, and in India is boiled with sugar to make a jelly. Borneo is a center of sago starch manufacturing. 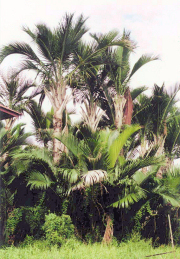 Sago palms are cultivated in plantations and the yield of starch is quite high - approximately 7 t ton of starch per ha. The palm is mature and ready for harvest in 6 - 8 years. It will by then be 24-26 feet high and 17-27 inch thick. The trunks are cut into 36 inch long logs with a weight of 50-100 kg for transport. The bark is 2 inch thick and removed by hand with a ship axe or in a more modern mechanized way on a conveyor. The logs contain 17 - 22% starch. The debarked logs are in the traditional process grated and screened on 120 mesh. Crude milk is concentrated and refined in two steps before dewatering on a basket centrifuge and flash dried. 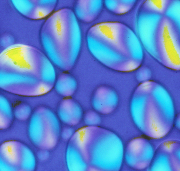 The starch may, however, be extracted with high yield and refined to international quality standard in a modern process and even further modified into specialty starches. Malaysia exports the starch and Japan and Taiwan are important markets. Both pearl and powder forms are exported. Potato "sago" pearls and Tapioca "sago" pearls are produced as substitutes in Europe. The large granules facilitates sedimentation during the refining process and in particular the dewatering.